Last summer I had the opportunity to participate and contribute to Summer Fest, a fun cross blog event which celebrates peak harvest season. A couple of days ago Margaret Roach from Away to Garden gave her readers a heads up that Summer Fest is coming back this year. Today’s theme is: Cukes and Zukes. 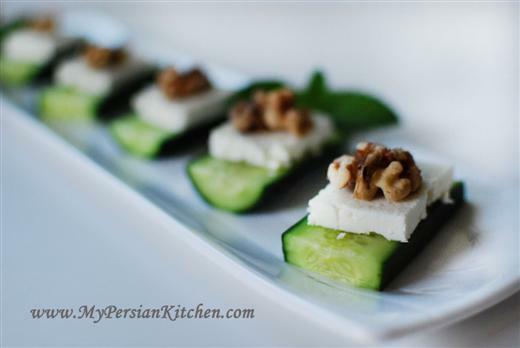 For said occasion I picked one of my favorite snacks made with Persian cucumbers. I came up with the idea for this recipe a few years back when I was on a no-carb diet. All I wanted was some Noon-o-Paneer, bread with feta cheese, but since I could not have any bread, I had to find a substitute. 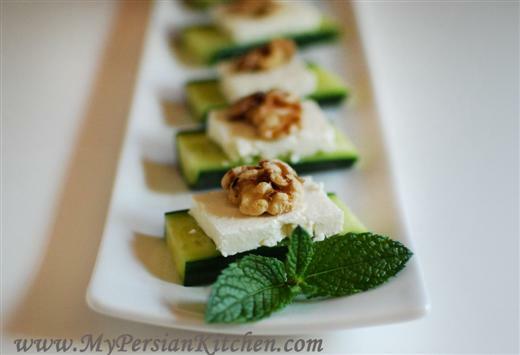 Sure enough Persian cucumbers saved the day and this combination soon became a favorite, especially in the summer time as it is so refreshing to eat. All you need for this recipe is Persian cucumbers or English cucumbers, your favorite type of Feta Cheese, and walnuts. I would suggest soaking the walnuts overnight in water so that they soften up a bit. Assemble the three ingredients as seen above and you are good to go! I think this combination can also go well as an appetizer. Fill up a platter with these next time you have a party, I am sure they will be a hit! Beautiful, beautiful photography! It’s really an inspiration. Even if I have tried some persian recipes as well at my blog, I always find something new which I didn’t know about on yours. This is beautiful, and combines some of my favorite ingredients, in such a super-simple, sure to be fantastic way! I’ll be making this one this weekend, whether for a solo snack or to serve friends. Thank you! And I hope you and your readers will stop by The Sister Project to check out my SummerFest contribution, a zucchini bread pudding. Love this recipe. Those 3 flavors sound perfect for summer treats. Looking forward to learning more about Persian cooking from your blog. Going to a Persian cooking class in 2 weeks, can’t wait. C’est beau,c’est simple, c’est bon et c’est sain. Samedi j’ai des invités je le ferai en apéritif. Merci sanamak. Ahha! I love this. Oddly enough I never thought of this version. I often serve a variation with Watermelon instead of the cucumber. Great presentation and photos. Absolutely amazing! Great job.